Get off my ceiling you blimmin' pest! With AvP dispatched in such rapid style (3 deaths in under an hour! What a feat!) it's time to look to the sequel for my first completion. 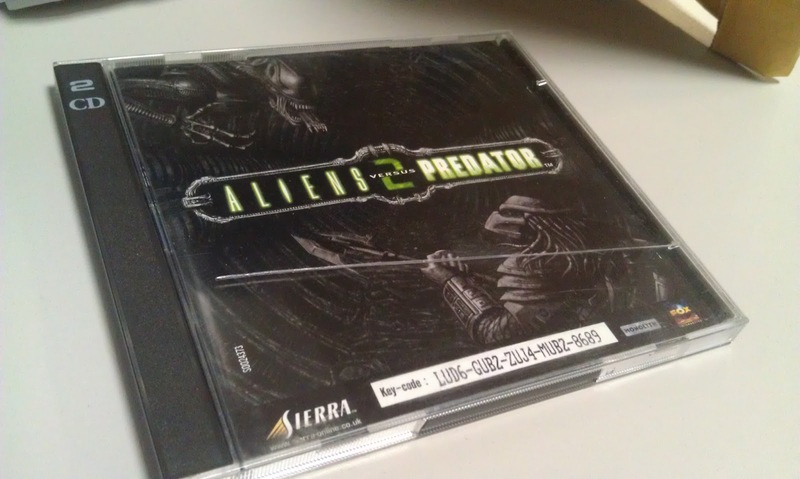 At the time I remember not enjoying AvP2 as much as the first, but from a modern perspective, I'm looking forward to a slightly more mature FPS that's learned a few lessons from its predecessors. I decide to save the best for last this time and head straight for the Marine campaign. Let's see how it goes. Firstly, apologies for the lack of screenshots. I thought I'd play this one in my lunchbreak at work but I forgot to grab FRAPS before starting. Somehow it feels wrong to go back and get some now - like I'm secretly having a second go. Right, on with the attempt. AvP's marine campaign has one of my absolute favourite opening sections. It takes a note from the films and understands that tension and fear is everything. It also knows that you know how both the xenomorph and predator look, sound and behave. They know that if you land in a room full of monsters with a giant rocket launcher that you won't be intimidated or afraid. That you'll wade into the fray with glib abandon. That can't happen. Not in this franchise (well not as a marine anyway). The opening section is as you'd expect. Your squad is sent to a remote colony with whom contact was lost, the dropship crashes, you have to set out into the colony on foot to turn on the power, you're separated from the squad and have to push on alone. Bosh. You move through the poorly lit corridors and as you go the designers start dropping in the beats that are going to ratchet up the tension. Your motion detector starts picking up movement, but it's doors or oversize insects or swinging chains. Three targeting dots pass slowly across the terrain before disappearing. A triumphal scream is heard and skinned bodies fall through the ceiling. You see a civilian being exploded just behind a closing bulkhead. You enter an open vista and shoulder cannon blasts destroy the bridge in front of you. You trace its source and see the silhouette of a predator you're ill equipped to deal with. He is, of course in the direction that you need to go. As you ascend you see a truck trying to escape but it's blown off the road and tumbles towards you causing you to frantically scramble to one side or the other. You climb further knowing that a showdown is coming, but the hilltop is deserted except for the building you need. You head inside and turn on the power. Now you have to get the beacon up so your friend's can join you in the dropship, and at this point you *know* that the predator is in here with you, you just know it. This is an FPS, you're going to have to shoot something at some point, but it just goes on and on. Every door registering on you motion detector, every bursting pipe, every elevator opening, each one is surely, *surely* the one with monsters behind it. You reach a large arena style area with lots of cover and a flashing sky above you. This is where it must happen. You're so close to the beacon it must be here. The reveal, the showdown, it must occur now. But still the tension won't relent. You move into an underground corridor and head towards the beacon. More flashing red lights, another elevator. The button is right there now, in front of you and through the window is where, after pressing it, the dropship will appear and no doubt be swarmed over or destroyed in front of you leaving you alone. You activate the beacon and your buddies land and all pile out. You head back through the, now lit, corridors and join them and are awarded with a ton of ammo and a rocket launcher. A full half hour in and I'm tense, totally involved and I haven't fired a single shot. Incredibly brave by the developers and unforgettable (two of the beats are stuck in my mind from the first time of playing and still unsettled me this time round!). So now I have to do it all again. I'm sent off on my own, unsurprisingly, now tasked with switching on the compound's defences. My team are on the radio with me and after I fire up the power all hell breaks loose. The radio explodes with panicked chatter and this time I know I'll be using my gun. 3 or 4 aliens burst in from various holes and I'm able to deal with them, albeit panickily, before I'm forced into a vent to find a way out. I've taken damage from alien blood and claws, but I think I'm okay. Presumably, in a few months time another squad will come through here and, creeping terrified through the carnage, find my body. They'll have seen blood stains, signs of gunfire, xeno corpses and acid splashes and wonder what on earth happened. Slowly they'll crawl on, so sure now that the next vent, the next steam geyser, the next dark corner will contain whatever monsters had done this. Maybe they'll be the hero though, who can end the cycle and do what I couldn't. They'll probably have it on easy though.